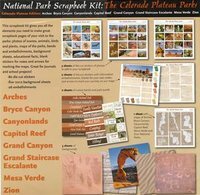 With this scrapbook kit you will have fun sharing your memories from your visits to America's National Parks and you may learn something new about the parks along your way. Kit includes decorative papers, stickers, punch-outs, and official symbols of the parks. Proceeds from the sales of this product support programs and services for national parks and other public lands. 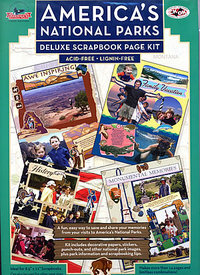 This scrapbook kit gives you all the elements you need to make great scrapbook pages of your visit to the parks. Includes photos of scenes, animals, birds and plants, maps of the parks, educational facts, and more! Great for personal scrapbooks, journals, and school projects.